I live by the motto that what you put out in the world comes back to you, usually in greater measure than what you give. 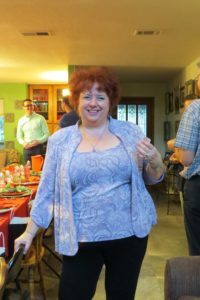 When I first learned of this “secret” to living a happy life, I wasn’t sure I believed it, but figured I could try it and see what happens. At this point in my life, I have had so much come back to me in so many ways, I cannot deny that it is so. Now you may be thinking, “Hey, I logged on to read Catherine’s whisky blog, not her metaphysical philosophy blog!” I am just so full of gratitude for the many blessings that I have received since I began my fabulous whisky life that I had to start there to lead into one of the most amazing and wonderful experiences I have had so far related to whisky! It was one where I gave a lot, but what I got in return was so overwhelming that I still cannot take it all in! 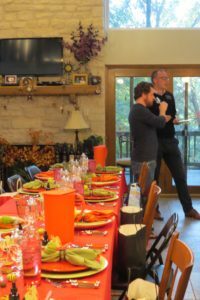 Regular readers will recall that last year I had the incredible blessing of hosting a whisky dinner at my house the night before Whiskies of the World in Austin. I have become friends with Dan Crowell, a global ambassador for Glenmorangie and Ardbeg. He came to my house and I invited some friends and we had such a lovely time! For more details, please read that post! I asked Dan if he wanted to come back this year and do it again on the Wednesday before WOW, September 28th. Not only did he want to, but he wanted to bring some friends, too! 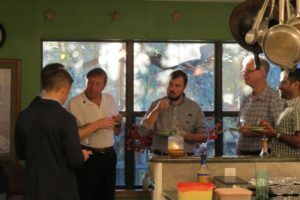 In addition to Dan, Brendan McCarron, assistant to Dr. Bill Lumsden and Head of Maturing Stocks for Glenmorangie and Ardbeg, and Marc Young, local Regional ambassador for Glenmorangie and Ardbeg, all came to my house to be part of this whisky dinner! 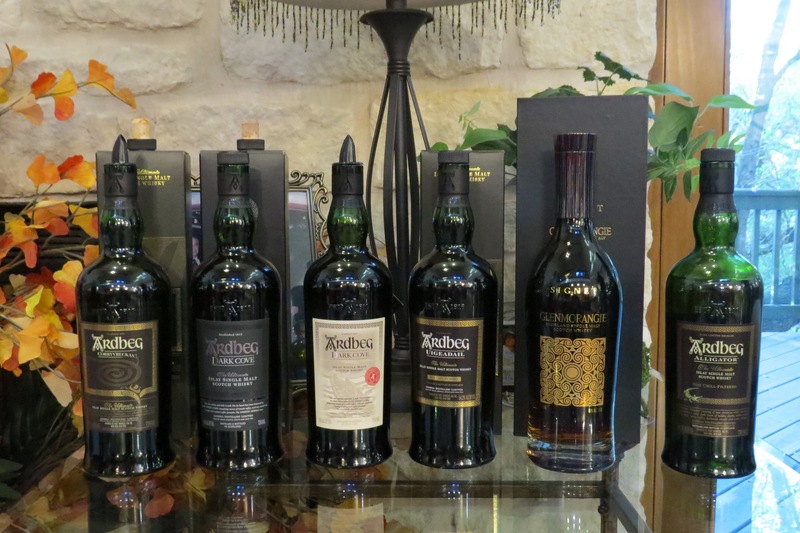 Dan wanted to bring some rarer whiskies in addition to the core range and some of the friends whom I invited also wanted to bring some whiskies from their collections, so when it was all said and done, we were looking at 18 whiskies for the evening! I decided this called for a pairing dinner. Now let me back up here and spread some gratitude because there was no way I could do this all by myself. First, and always foremost, I must thank my husband, Steve Alexander. He is an endless supporter of me and it is through his continued patience, love, ideas, time, work and money that I get to live the life I live! Thank-you my dearest, darling! I also am blessed with the help and support of so many good friends. I will shout out to them at different points in this story, but want to start by mentioning Joanne Pall, Robin Heart Sheppard and my best friend in the world, Lisa Abbott. These women, along with Steve, helped me shape the dinner into what it became with ideas, suggestions, advice and opinions. Dan Crowell also helped me here as well. 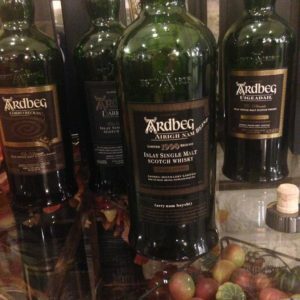 The final plan was to have an hour of mingling as people arrived, creating 5 stations for sampling the core range Glenmorangies and Ardbeg 10. 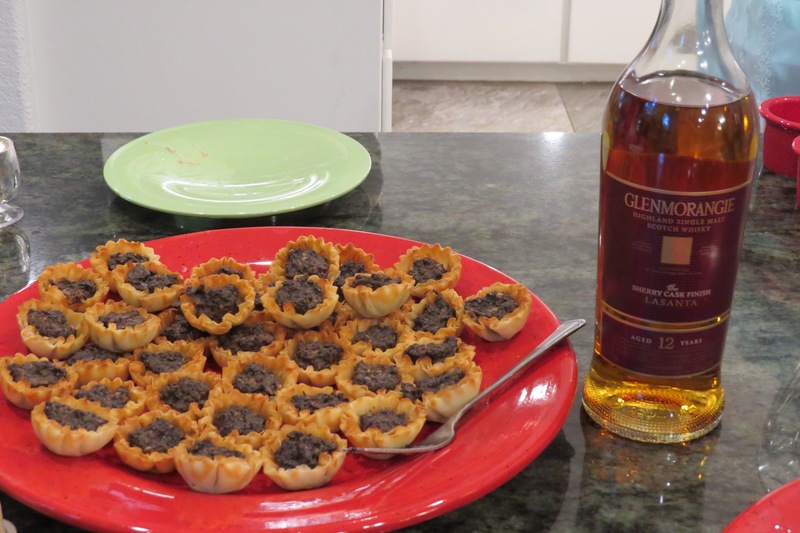 We came up with appetizers to pair and the idea that people would float around as everyone arrived, trying a little whisky with some food designed to accentuate it. We officially kicked off at 6:30! 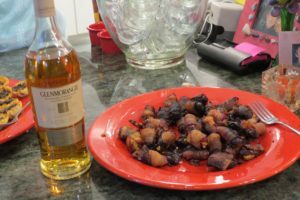 I made a salmon recipe, cuting up the fish into bite size pieces and paired this with the Glenmorangie Original. For the Lasanta, Steve made bacon wrapped, feta cheese stuffed dates, and Joanne made delicious mushroom tartlets in filo dough to pair with the Nectar d’Or. For the Quinta Ruban we had a selection of olives, nuts and dried fruits. The Ardbeg 10 was paired with blue cheese, green apples and Baba Ganoush on crackers. Lisa brought the dip! 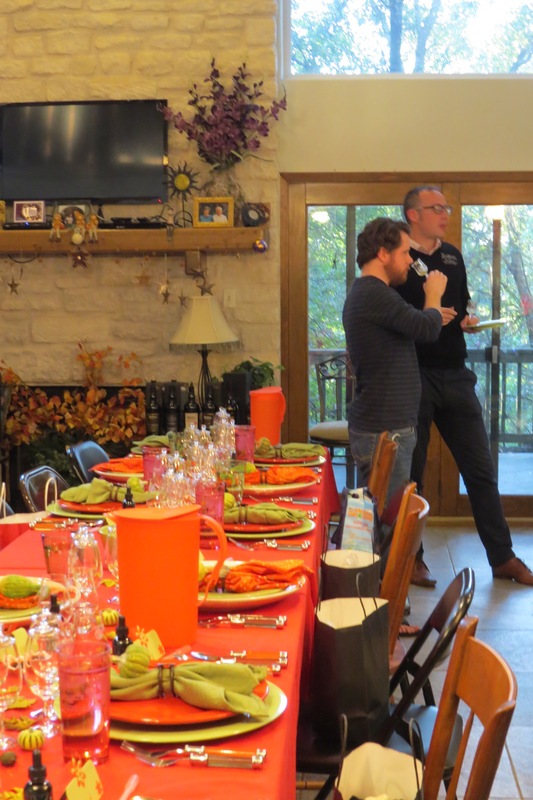 The last guests, braving the awful Austin traffic, made it by 7:30 when we were transitioning to the sit down portion of the dinner. Before I tell you about that, I want to tell you a little bit more about the set up. I invited quite a few people. 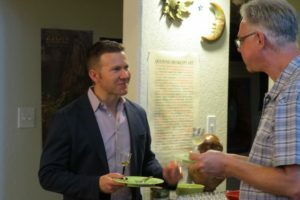 I have made so many friends over the last few years in the Scotch community in Austin and I really wanted to squeeze in as many people as possible. 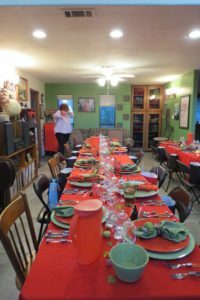 In the end, we had a total of 24 of us at the dinner, though it was going to be 28 when I stated setting the tables and slowly trickled down by the start of the dinner. Steve and I moved a bunch of furniture around and set up two long tables, basically 2, 8 foot tables end to end and then 2 more to make to very long tables. I had hoped to have one big table but in the end two tables proved a better choice, though some folks had to sit with their backs to each other. Joanne came early with her friend Anthony to help with cooking and set up, and I also received the help of my friend Donna with some food preparations and my friend Melissa volunteered to come and be the kitchen help for the night! Steve came home from work early and then Dan, Marc and Brendan all arrived around 5ish. Some of the guests came early, to help and to get ahead of the traffic. So I had a house full of helpers making this all possible. At about 7:30 we all sat down and the whisky pairing and education began in earnest! 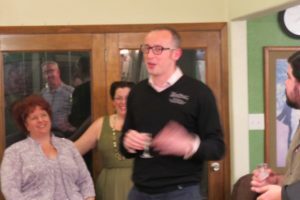 Brendan stood up before each course and gave us some information about each whisky. 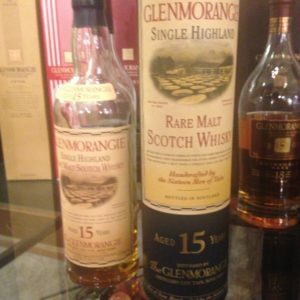 I made the executive decision to alternate between Glenmorangies and Ardbegs because I felt it would be better to have the variety and I also think if you have too many peated whiskies together you get a little burned out on peat. This was definitely commented on beforehand as the classic wisdom is that you cannot taste other whisky once you have peat, but I have not found this to be the case. Lisa was very helpful in working all of this out, and came over the Sunday before the dinner to help me work it all out! 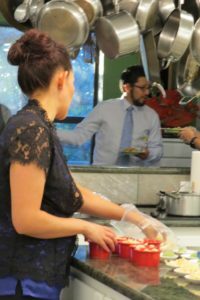 Different people contributed different things to the dinner. My friend Aidan gave me $100 to spend and I bought raw oysters with that! Pete and Ato also each gave me $100 and that covered the sushi bill! Other folks brought BBQ Brisket, cheesecakes, chocolates, strawberries, cheese and jam, and Baba Ganoush. 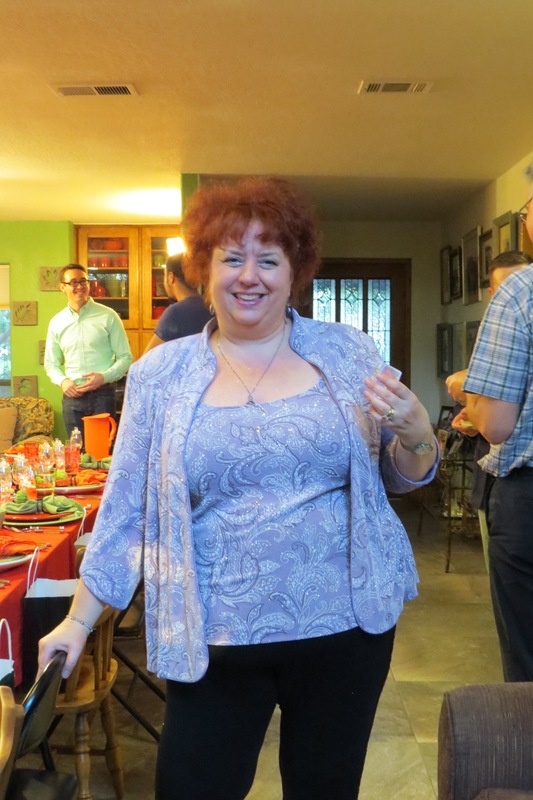 Still others contributed money after the dinner, too! Your stomach may be aching at this point, but it was not really too bad as long as you stuck to the very small portions we made for everyone! 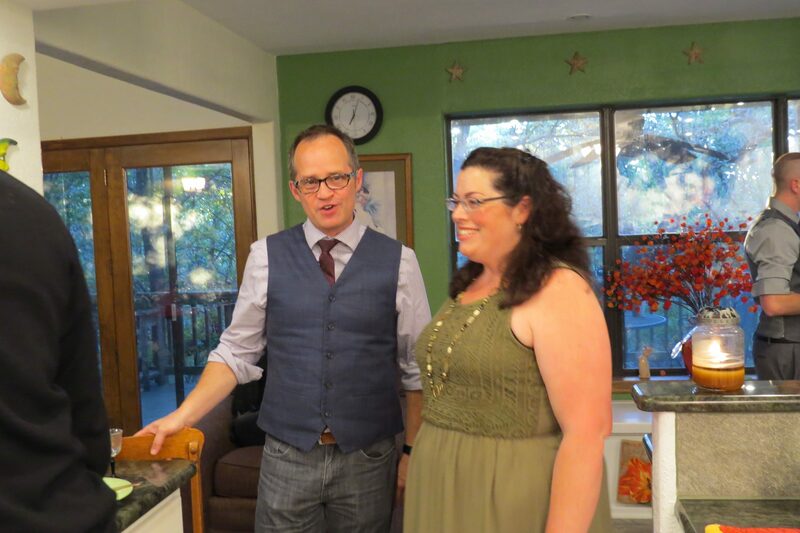 Brendan had been regaling us with information all night and the flow of food and dishes was just superb! Austin had brought some cheesecake, Tierney had brought strawberries and chocolates and Jason’s wife had baked us a puff pastry with caramelized pears! We dished up the desserts and passed around the final three Scotches: The Signet, Milsean and Astar, all from Glenmorangie. People started leaving as it was getting on to about 11 or so. 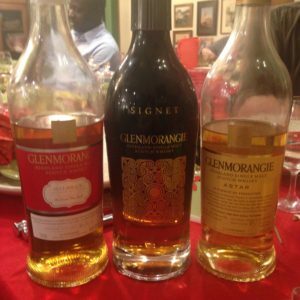 Two guests, Bentley and Kyle, had brought some special Glenmorangie and Ardbeg’s from their collections as a surprise and we all got to try a little of these. 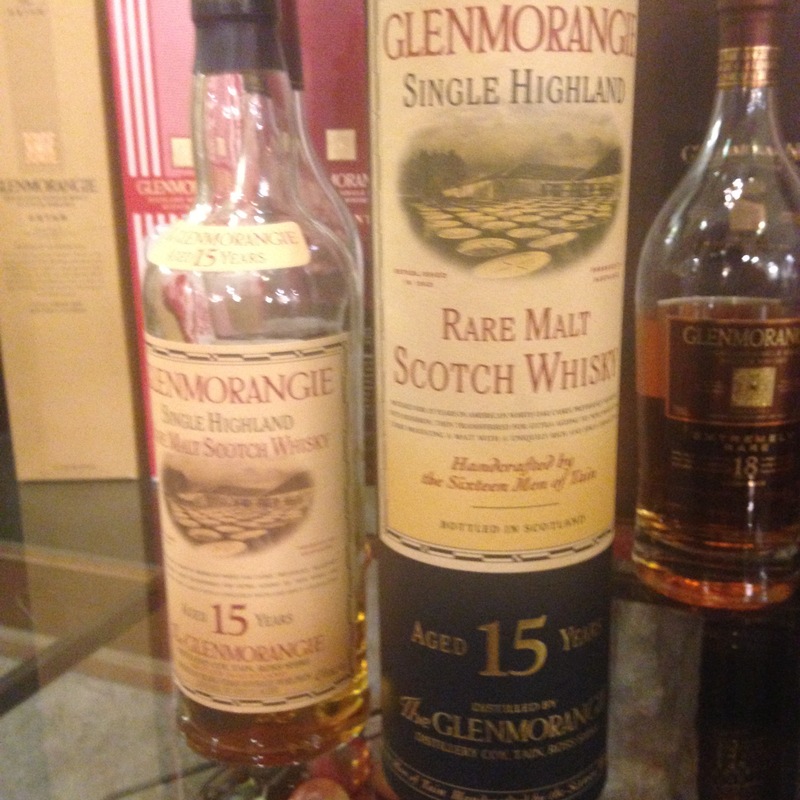 One was a 15 year old Glenmorangie and the other was a 2008 special release Arbdbeg called Airigh Nam Beist. This evening was just beyond my wildest dreams in terms of how good it would be and how perfectly wonderful all the food went with everything! 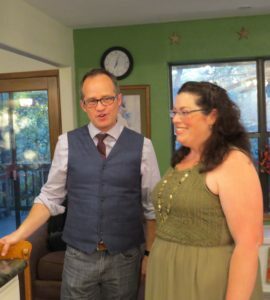 Lisa and I had not tried many of the whiskies, or the food for that matter, and we had to just give it our best guess as to what would go well together. 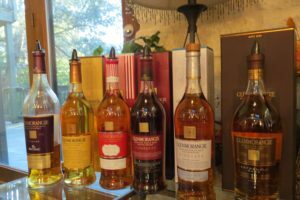 I did read as much as I could ahead of time online and from my library of whisky magazines to see what foods people had paired with these whiskies in the past. That is where I found out about Baba Ganoush with Ardbeg (stunningly delicious) and sushi with Scotch. Brendan is funny, knowledgeable, personable, accessible and has a killer Glaswegian accent! He generously shared so much with all of us, and really brought to life each whisky with anecdotes and history. My only complaint, and it is really just an observation, is that we didn’t get enough Dan Crowell! He is a beloved speaker, here. He is full of life and in constant motion. He is irreverent and funny, but knows so much about whisky it is astonishing! He really let Brendan be the main attraction and I would have loved to hear more from Dan, too! The next few days were filled with Whiskies of the World for me, and I will tell you about that in my next blog post. 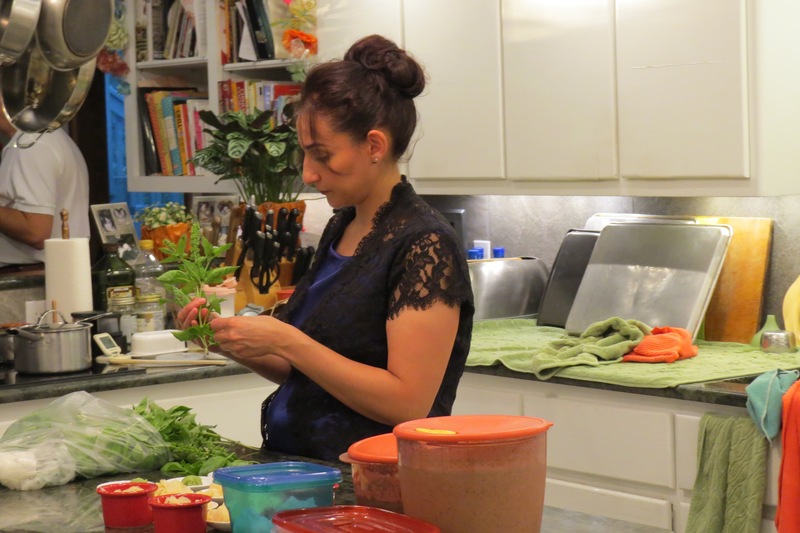 As you can imagine, this dinner generated a huge amount of dirty glasses and dishes. My God of a husband ran many loads of dishes over the next few days, and Lisa came over to help with some of the clean up as well. 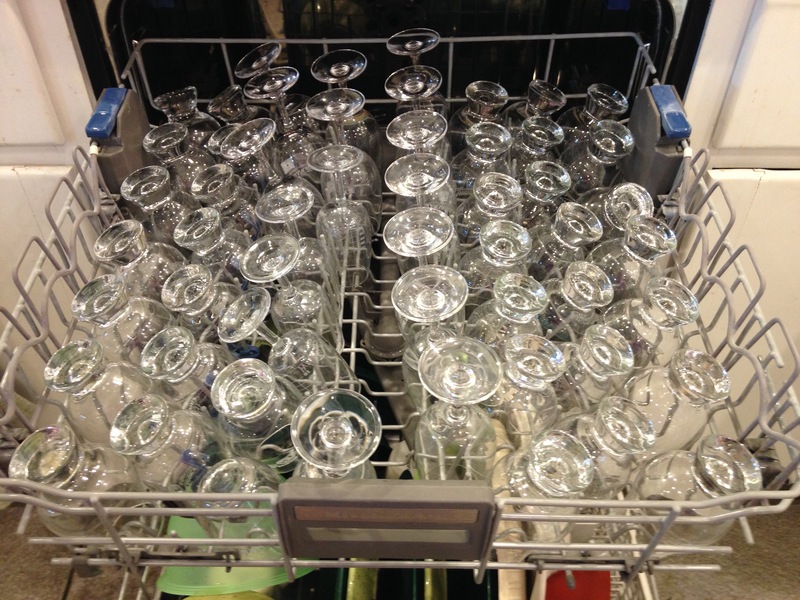 When I got home from Houston on Sunday, there were still more glasses to wash and stacks of dishes to put away! But it was all worth it! This is just a small glimpse into my fabulous whisky life! Copyright © 2019 Austin Scotch Lovers. All Rights Reserved. Designed by Themes by bavotasan.com.